Suffice to say that conditions in my life were such that I apparently had nothing to tie to. After leaving the corporation I went with one of the independent companies and was successful in each territory assigned me to the extent that I did not have sufficient work to keep me occupied. Again drink became my master to such a measure that in the latter part of September 1930 I walked out of my office with the intention of going on a `tear’ until my money was gone and after that,—it just didn’t seem to matter what became of me,—I didn’t care to live. I am praising God that He over-ruled and led me to the Mission. God reached down His hand in gracious mercy and through the blood of His Son cleansed what would have otherwise been another dreg in the social gutter. Today my feet are implanted on the solid rock of faith in our Lord Jesus Christ, and to me has come the ineffable peace which can only come from communion through Him to our heavenly Father, and in my heart is a song of praise for the power of God that reaches men through His Son. “He was in the steel business approximately 40 years, 35 of which were spent with the various subsidiaries of the U.S. Steel Corporation. 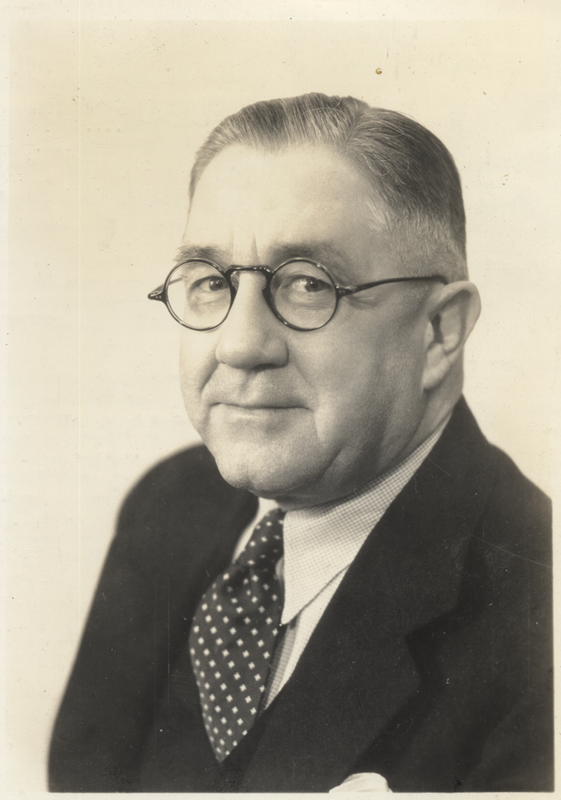 He served 22 years in the Denver, Colorado office of American Sheet 7 Tin Plate Co. as Assistant Manager of Sales, where he received a silver service medal in 1927. 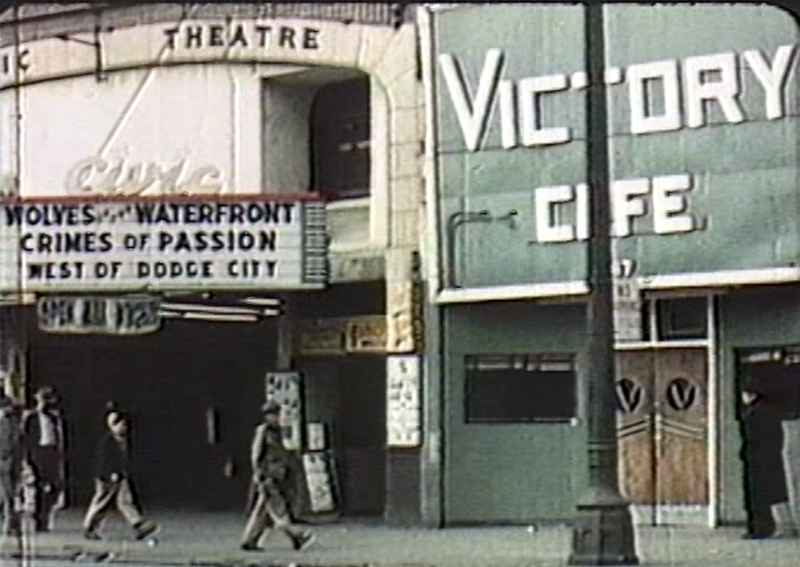 He was later connected with the Granite City Steel Co. where he served as Manager of Sales in both Memphis, Tenn. And Dallas, Tex. Devoted four years to the URM. 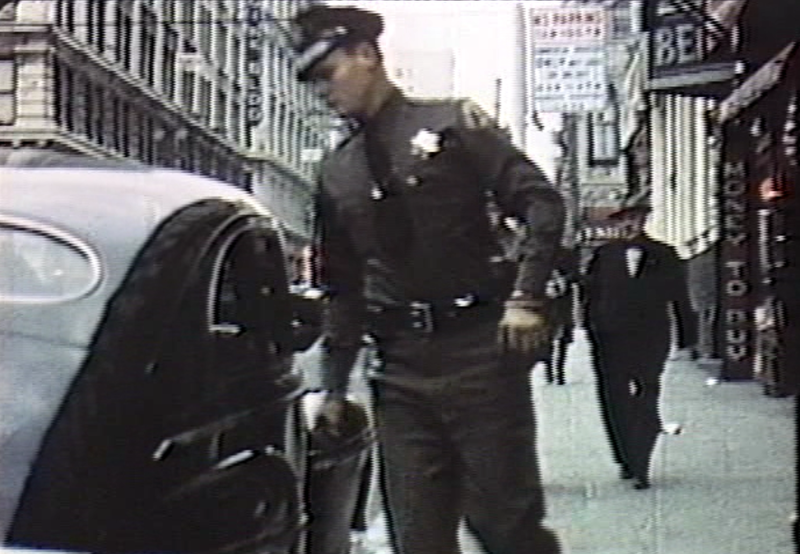 It is the story of Arthur Hawkins which is told in the film Of Scrap & Steel, which will be screened on the roof of the Union Rescue Mission on Thursday evening. She was 24, and her answer was yes. Moody then gave her a scripture text which would be the star by which she steered: “He that dwelleth in the secret place of the most High shall abide under the shadow of the almighty” (Psalm 91). Moody collapsed before the meeting ended, and was never well enough to preach again. He died the following month, and his crusade was carried on that night and in years to come by R.A. Torrey. Perhaps the injection of Torrey’s charisma as Mother Benton’s heart was coalescing around her true path is what brought her to Los Angeles. Many missionaries were then looking to the west. Torrey himself would soon arrive in this city to be both a founding Dean of The Bible Institute of Los Angeles (BIOLA), and pastor of the non-denominational The Church of the Open Door, both housed in the Romanesque Revival church and auditorium at 6th and Hope, built in the image of the Moody Bible Institute in Chicago. While in Los Angeles, Torrey would also edit the 4-volume 1917 edition of the influential text The Fundamentals produced at the direction of BIOLA supporter Lyman Stewart. Mother Benton’s arrival, while less auspicious, would have a lasting impact on the charitable face of the city. 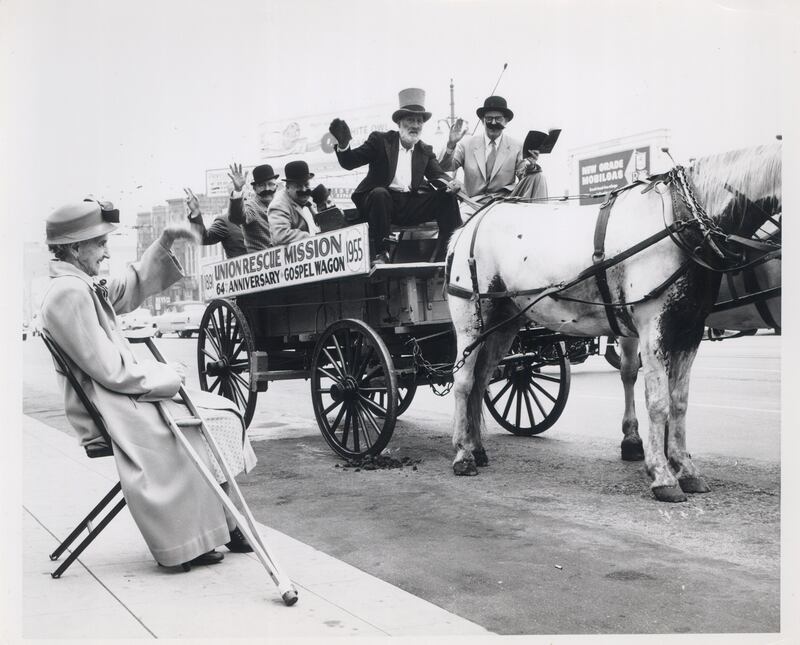 On the evening of October 7th, 1907, she arrived at the Union Rescue Mission (URM). There was no pianist that night, so she volunteered. 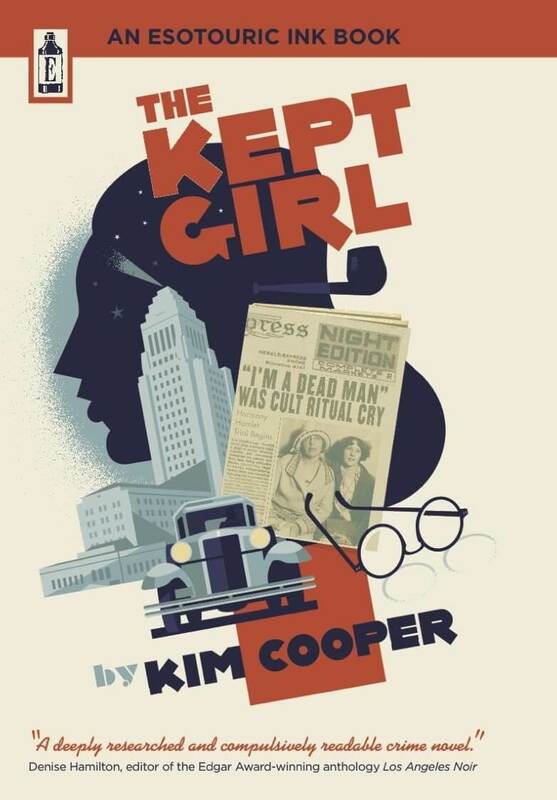 She returned the next day and the next, and soon she was out on the corner of 2nd & Los Angeles with her tambourine and her newlywed husband, Arthur L. Benton, assistant superintendent of the URM. 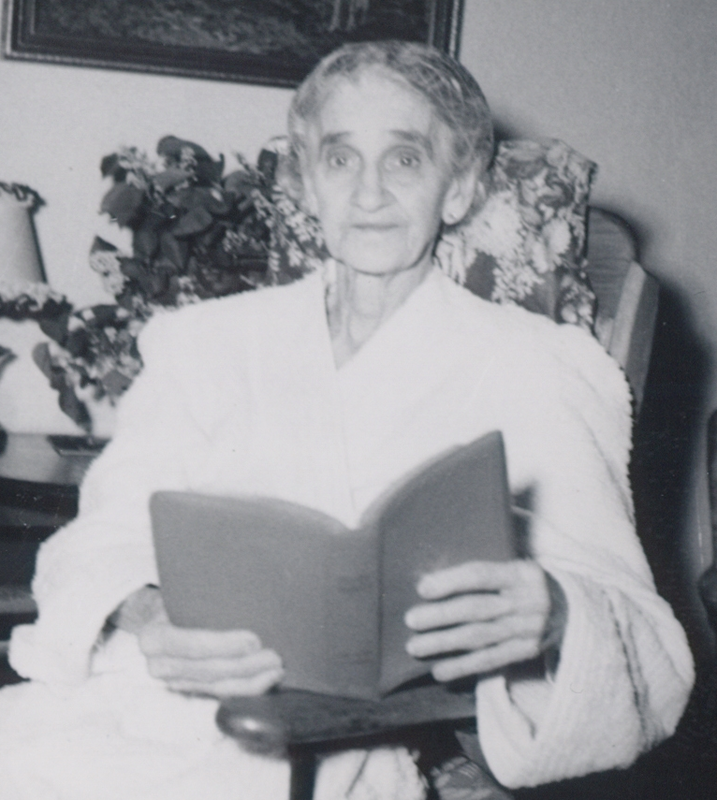 In her 37 years at the URM, Mother Benton passed up through the ranks as pianist, clerk, and finally house mother. She would serve under 32 superintendents. Mother’s husband Arthur Benton was a cabaret pianist from Grand Rapids, MI, whose life had been ravaged by alcoholism. 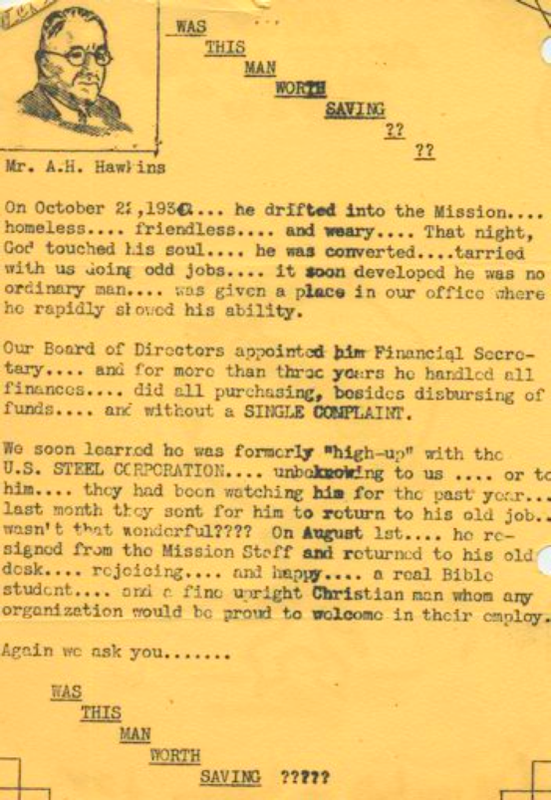 He had been converted by Melvin E. Trotter of Pacific Garden Mission in Chicago, and had been sent out just a few years earlier to help Melvin’s brother William, who was then the URM’s superintendent. A project which Mother Benton held particularly dear was the Women’s Auxiliary, organized in 1936. 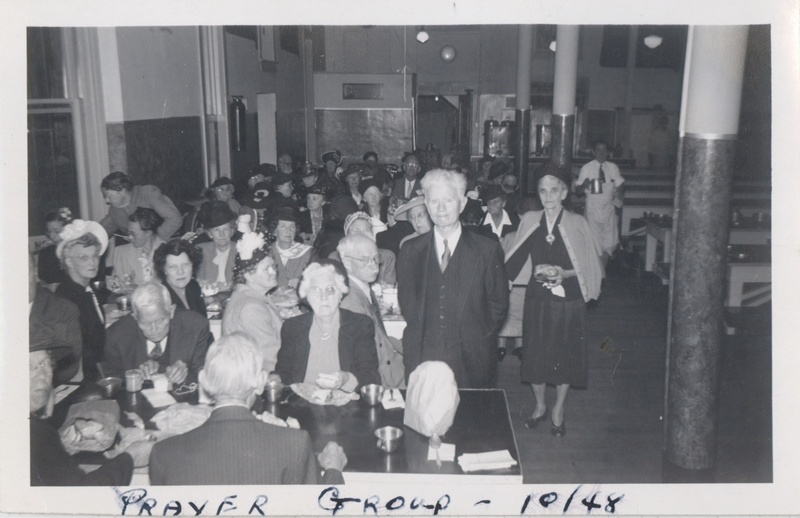 Gathering on the first and third Wednesdays, their meetings routinely attracted over 100 helpers for the mending of old clothes and linens for redistribution in the Mission and for the maintenance of the dormitories. 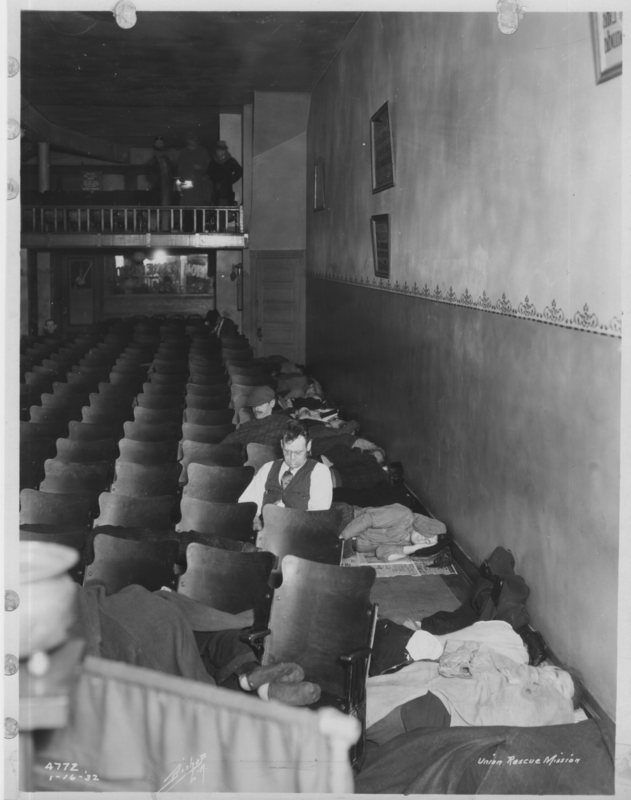 In the late 1930s, the URM had 600 beds for the homeless. In 1946 alone, the Auxiliary produced almost 10,000 garments, nearly a third of the 33,000 items of clothing distributed to the needy at the URM. One of the boys with whom she had prayed in the URM chapel was the notorious outlaw Billy Stiles. She was sitting with him in the chapel on the day in 1913, shortly after he wandered in from the sinner’s road that was Main Street, when he experienced his rebirth. The next day Stiles presented Mother Benton with a suitcase of nitroglycerine, a gift from a retired safe-cracker who was now on the straight and narrow. Mother Benton, looking back on her half decade of service at the URM noted, “While this is a man’s Mission, scores of women and girls in distress have been helped and guided.” Perhaps she was remembering the voyage she made in February 1930, when she traveled to the State Penitentiary in Florence, Arizona to sit by the side of convicted murderess Eva Dugan as she awaited her death sentence. Mother Benton sat up all night with Mrs. Dugan on her last night on earth, and heard her testimonial that faith in Jesus Christ had saved her soul. The following morning, Mrs. Dugan went to the gallows, dying instantly when her head was severed from her neck and rolled down among the witnesses. There were five women present, and two fainted, but we do not know if Mother Benton was among that number. Mother Benton died on October 4, 1956, at the age of 81. The photo on the right shows the Swanfeldt Building as it appeared in the late 1920s, with its northern half still occupied by the Swanfeldt Awning & Tent Company. 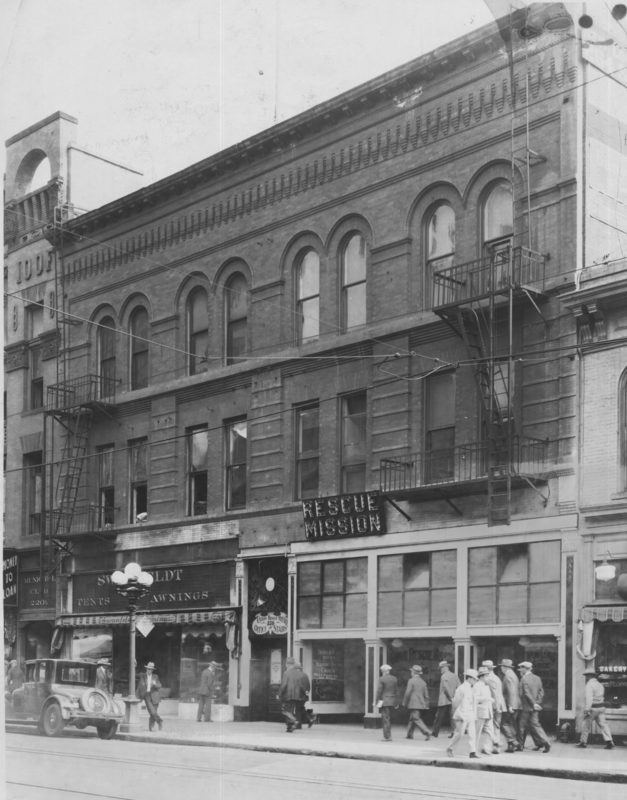 The southern section is home to the Union Rescue Mission (URM). In 1926, the URM purchased the southern half of the Swanfeldt building for $100,000. The City’s seizure by eminent domain of the URM’s building at 145 N. Main forced them to make a quick move to new quarters. The structure demolished, the old 145 N. Main property is on what is now the southern lawn of City Hall. The Swanfeldt family operated Catalina Island’s celebrated “Tent City” from 1895 to 1902, and were the canvas kings of Los Angeles. Even after the tent concession monopoly was relinquished to the Santa Catalina Island Company, the Swanfeldts continue to set the bar for tent manufacturing in the southland. 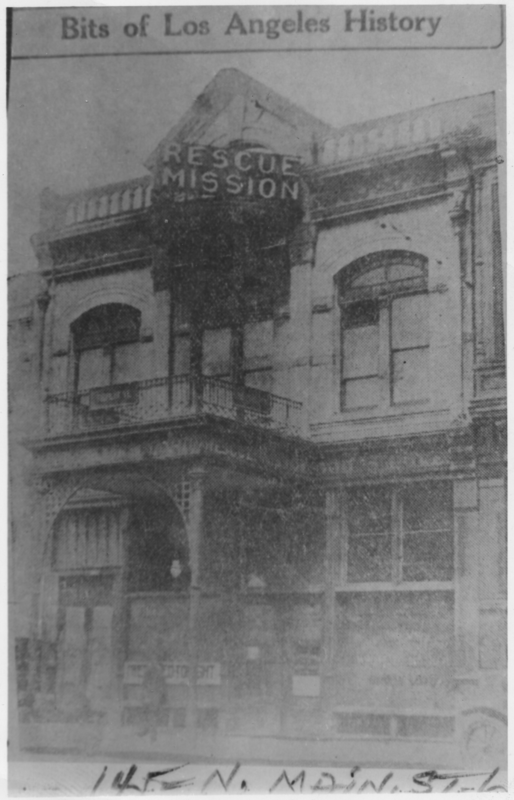 It is of peripheral interest to note that in its earliest days (circa 1893) the Union Rescue Mission operated out of a massive tent on 2nd Street near Main. By 1931, with the URM still occupying only the southern half of the three-story Swanfeldt Building, 300 to 400 people were fed daily, with the number swelling to well over 500 on Sundays. 100 men were bedded nightly in the third-floor dormitory. The dining room was in the basement of the structure, and could accommodate 325 people at a sitting. Meals were served each morning and evening, with breakfast provided to those who had spent the night. The clothing commissary, which offered donated items including suits, work clothes, hats, shoes, neck-ties and socks, was on the second floor. 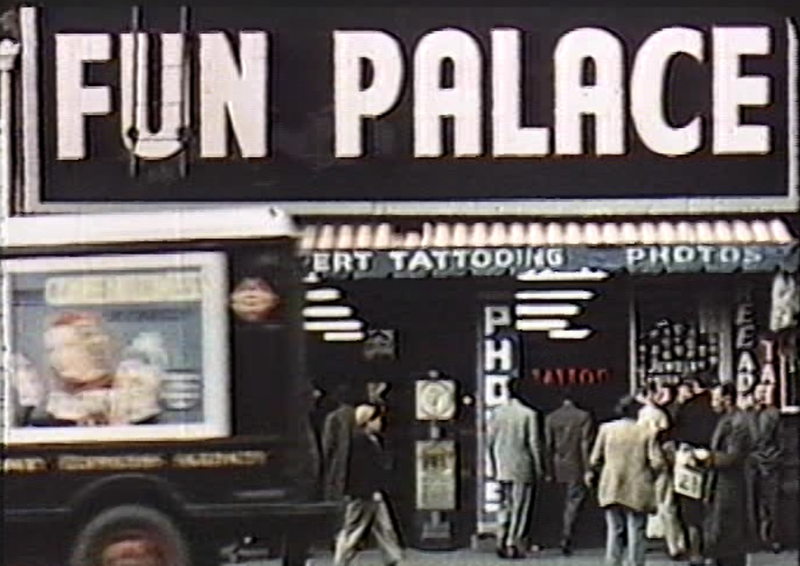 The laundry, which in 1931 was a very recent addition, was on the ground floor. The URM’s managers immediately made note of the savings in time and money that this new laundry facility provided. As the depression proceeded and the first hints of war were heard, the URM felt the need of more space. 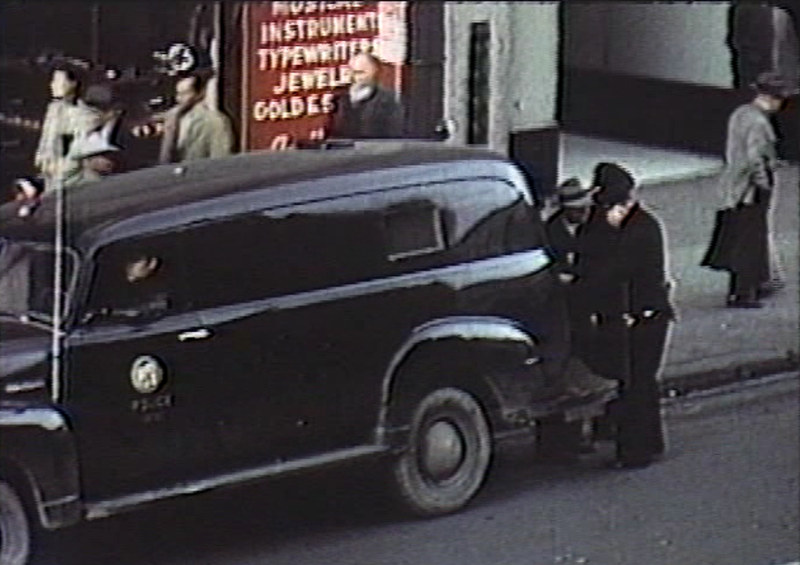 In 1938, the URM purchased the northern half of the Swanfeldt Building, and the Swanfeldts moved their plant to North Figueroa Street. 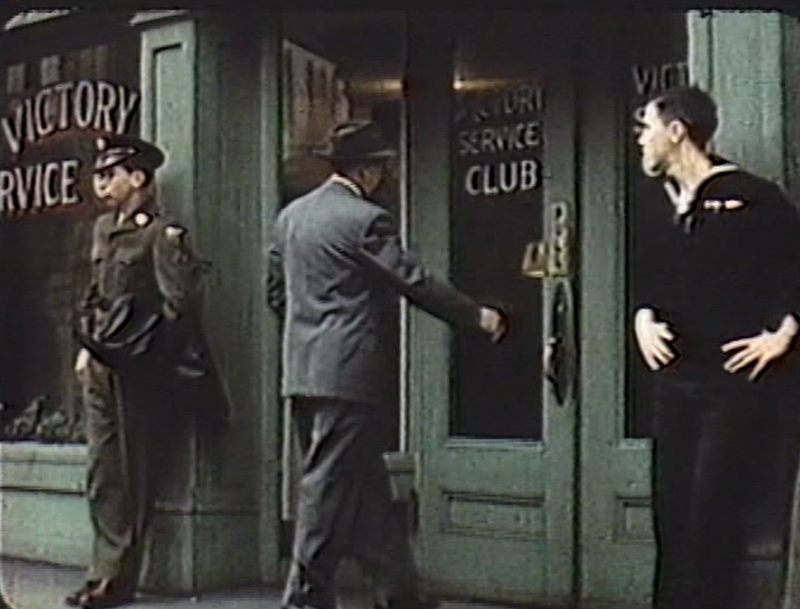 In early 1942, the URM purchased The Oddfellows Club Building just to the north of the Swanfeldt—note the the “IOOF” in the upper coursework— and it became the Victory Service Club, a social club and assistance center for young Christian servicemen and their friends, which will be the subject of several forthcoming blog posts.